A map with lines and letters on it. Because the spin of the Earth is faster than the speed of time from a relativistic perspective, the time of day is not the same at all points on the planet at the same time. (Indeed, it has never been 3pm in Beiruit.) To reduce the problems caused by this sad fact of astro-geography, the Earth is artificially divided into ten time zones, usually known by their letters. While some see the divisions as arbitrary, the zoning system is highly complex while remaining simple to understand and creating a much less confusing world for us all to live in. The system was instituted by Benjamin_Franklin to make everyone live up to the Protestant Work Ethic or die trying. For those without comedic tastes, the "questionable parody" of this website called Wikipedia have an article about Time zone. 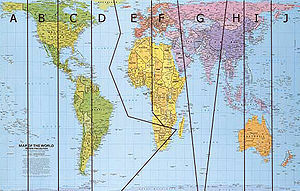 Starting from the left-hand side of the planet, the time zones run through the alphabet from A to J. Time Zone A contains Alaska, and is ten hours ahead of GMT. Time Zone B contains about half of the United States and Canada, and is half an hour behind TZA. Time Zone C contains the other half of North America and a large bit of South America. For half the year this zone is one hour ahead of TZB and during winter it falls behind by five minutes a day until it gets back to the same time and is reset to the one hour difference. Time Zone D contains half of South America, most of Greenland, and part of Africa. It is exactly three hours behind GMT in winter, and two and a half hours ahead during the (southern hemisphere) winter. Time Zone E is also called GMT, which stands for Government Meandering Time and is the basis for the scheduling of the British public transport system. It also contains countries Britain would like to own but doesn't. Yet. Time Zone F contains some places east of GMT, and is approximately two hours late for its train. Time Zone G contains the Indian subcontinent and most of the former Soviet Union. It is "developing". Time Zone H contains China and is thus rather shody, but cheap. It's human rights record is about fifty years behind that of Time Zone F.
Time Zone I is "Tuesday". Time Zone J contains some of those islands everyone forgets exist, including Easter Island, which takes its name from the constant Easter experienced in that region. 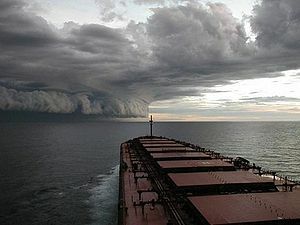 An unlucky ship about to cross time zones. Travelling from one time zone to another can be disconcerting and result in an increase in or shortening of the human lifespan. Amelia Earhart was the first person to fully exploit this loophole and is currently immortal. Politically, the difference in time can cause any number of problems, most notably the difficulty of scheduling meetings of the United Nations and the United Ninjas. Amnesty International have fought a long campaign against the use of time by totalitarian regimes in countries that lie across more than one zone. A number of nations have been known to change time zone regularly as a ploy for popular support or to exploit tax loopholes.